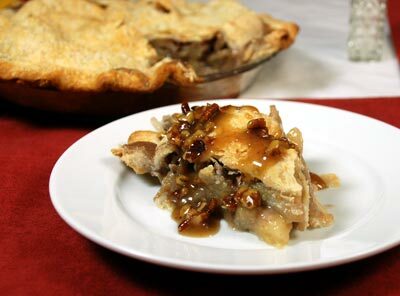 A wonderful variation on America's favorite pie! Toast the pecan pieces in a frying pan over medium low heat, stirring frequently, until they begin to color and become fragrant, about 7 minutes. Pour out of the pan and set aside. In a small saucepan, stir together the brown sugar and cornstarch. Stir in water, half and half and corn syrup. Cook over medium heat, stirring until the mixture begins to boil. Cook and stir 2 minutes longer, then stir in the toasted pecans, butter and vanilla and set aside to cool. In a small dish, stir together flour, cinnamon and granulated sugar. In a large bowl combine the sliced apples and raisins; pour the cinnamon mixture over and toss gently until the apple pieces are coated. Fit one crust into a 9-inch pie plate and trim excess dough. Pour the apple mixture into the pie shell. Spoon just half of the caramel-pecan mixture over the apples, then top with the second crust, folding the extra top crust under the rim of the bottom crust, then crimping the two together. Make eight radial slashes in the top crust and cut a vent hole in the center also. If the edges are browning too fast, cover them with strips of aluminum foil. Remove the pie from the oven and while it's still hot, spoon and drizzle the remaining caramel-nut mixture onto the crust in a thin layer. If the sauce goes on too thickly, it won't set up, so keep it to a thin layer. Allow the pie to cool before serving.